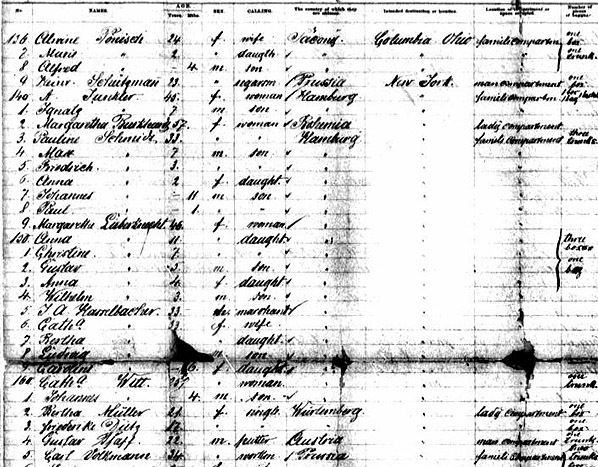 Early on in my search for American Hasselbacher families, I found a New York passenger list (below) from 1884 listing the arrival of J.A. Hasselbacher (2 s’s) and his wife Cath. who were both 33 y.o. They had three children whose names and ages were more or less obscured but appeared to be Bertha (or Rutha), Ludwig, and Caroline. I was not able to place them and I put them on the back burner. As I accumulate more information in general, occasionally other things tumble unexpectedly into place as it did in this case. The family shows up next as well-established in Oakland, California. A series of the next three census reports, some additional passenger lists as citizens, and a WWI registration allows the following summary. John Andrew (Johann Andreas) Hasselbacher is born 6 Feb 1851 in Dinkelsbuhl, Germany. He is a brushmaker and establishes his own business in America. About 1880 while still in Germany he marries Katherina, (b.13 Feb 1851 in Regensberg, Germany). When they immigrate in 1884, they have the three children above whose names become Lewis Charles (b. 13 Dec. 1880) and Lena b. Oct 1883). Bertha dies before 1900. The couple lists an additional two children, Wilhelmina (b. Oct 1883) and Clara (b. Sept 1889). There is some ambiguity about where the two younger children are born: Germany or California. The birth dates seem incompatible as well: two children in 1883. These additions may well have been born in California as listed in later censuses, but their initial mention in 1900 gives place of birth as Germany and also lists immigration dates of 1892. An apprentice brushmaker, Alvis Landsman, also arrives in 1892 and is living with the family in 1900. It seems more probable that Mena and Clara are relatives who came over later and were "adopted." Perhaps the answer to this riddle will become available if descendants step forward with more information. Are these folks a part of my Hasselbacher Family? It is quite possible but the links are not in hand. The initial spelling used two “s”’s but then settles on a single “s”. Dinkelsbuhl is just down the romantic highway, less than 70 km from the initial Franconian villages from which the rest of the Hasselbachers on these pages come from. A few weeks from now I will visit Dinkelsbuhl, where coincidently my Great-Grandfather Xaver Jakob Bayerl (also a brushmaker) was born in 1865. Perhaps I will be able to find additional information. If I were to guess, a likely connection might be through one of the other two sons of Steffan Hasselbacher of Austria about whom I now know very little, but about whom I intend to learn much more. I will keep you all posted. Help me if you can. The church books of St. Georg’s Church confirm that J. Andreas was born 6 Feb 1851 and his baptismal name appears to be Brandna. His father was Andreas Hasselbacher, a Gutnermeister (gardener) who lived in House Number 108. 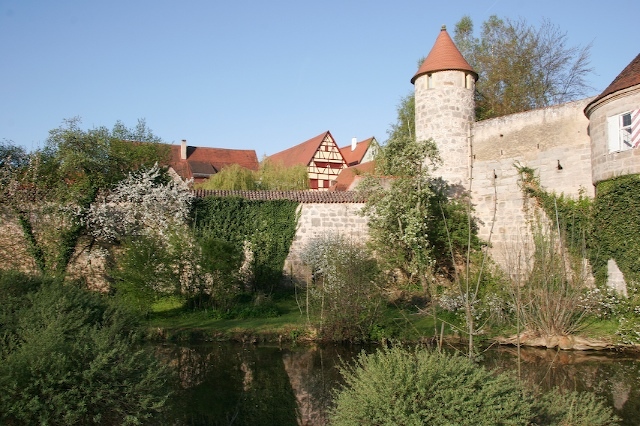 His mother, Marianne, was from Durwangen, 5 km to the north of Dinkelsbühl but her last name is subject to correction. Since there were several other children to this senior couple I got several cracks at her name. The best guess so far is something like “Göengerle” but other unreadable versions looked as different as Jüreg. That is the nature of church records where the scribes write what they hear spoken. Johann Andreas had at least five siblings between 1848 and 1861 to the same parents. There are also other Hasselbacher couples having children, including Joseph Hasselbacher and Eva Brückner of House Number 171 who have a son Johann Andreas on 19 Dec 1841, ten years before the birth of our J. Andreas. Still another couple; Andreas (whose father is Max H.) and ?Mack Carolina, born 6 Mar 1851) are married on 13 Sept 1870. There are still other parings and births that I did not have time to unravel. There is much name sharing among the families as if they were related. Despite the several dozen Hasselbachers I found in the mid 19th century, I could not find any of the children of our Johann Andreas, nor evidence of his marriage to Katherina. The nature of the records was such that I believe I would have found them if they had been there. Since Katharina was born in Regensberg, I must assume the couple met and raised their families elsewhere than Dinkelsbühl, perhaps Regensburg. That is a search for another time. What did I learn? How did the Hasselbachers get to Dinkelsbühl? The short answer is that I do not know. I did not have the time go back as far as I would have liked, but they appear to have been there in numbers by the early 1800s. There is more to learn in these records. 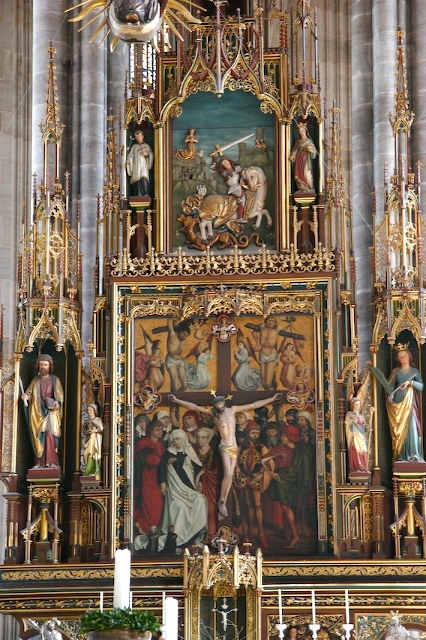 Dinkelsbühl is a Catholic town. It seems a little atypical that religious refugees fleeing a forced Catholic conversion would go to a Catholic town, but a hundred or more years would have passed for the usual mixings to occur. (In this same time period, both of my great-grandparents were in such “mixed” marriages that were obviously occurring.) It is also quite possible that this line is a very different one from the descendants of Gresten, Austria. I also have a better feeling about the spelling issue. Everyone I spoke to whom aught to know told me not to make much of the variation among Hasselbacher, Haselbacher, Haßelbacher, or for that matter Haaselbacher. The church official wrote what they heard, and there are some differences in how these spellings are pronounced. In addition, the priest’s own personal styles of handwriting may confuse later interpretations. I saw myself several variations of how the letters are formed. In looking at the Hasselbachers of Dinkelsbühl, the same families can have their name spelled in all three of the major ways: ss, s, and ß. So it was even as far back as the Gresten transcriptions. As society got more literate, different family lines may have more easily settled into a uniform pattern, but it may not pay to overemphasize the significance of these early spellings. I will have more to write about this elsewhere in these pages where I will show how our ancestors signed their own names, and how German speakers pronounce the different spelling variations. For now I am going to put the Hasselbachers of Dinkelsbühl and California on the back burner. I hope someone else takes up the challenge. Contact me for the additional information I have. I located a passport application for Johann Andreas. It confirms the spelling of his name in America, as well as his birthdate, father's name, and birthplace. 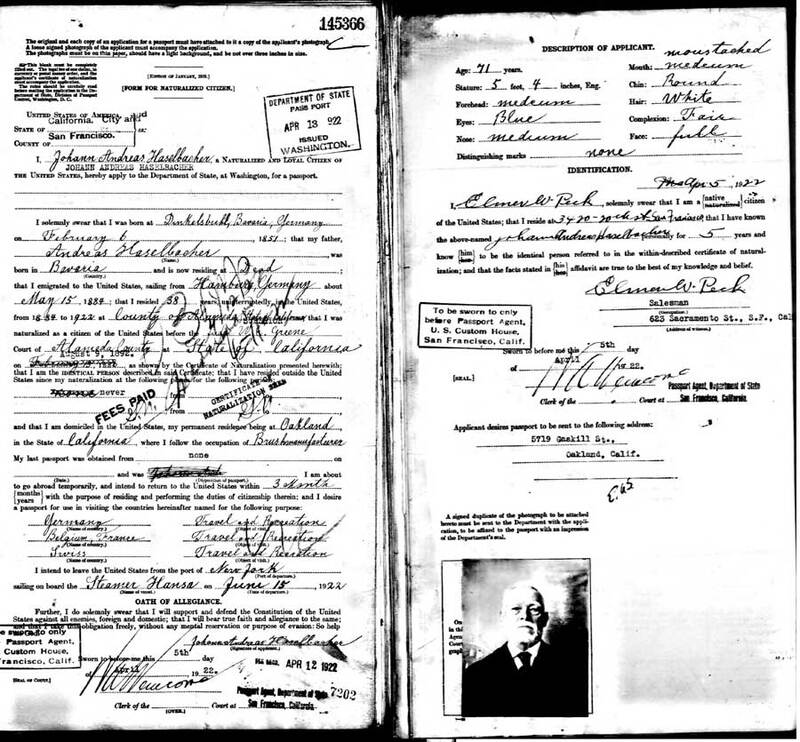 It gives the date of his arrival (May 15, 1884) and of naturalization in Alamedda Co.( Aug 9, 1892). In Calaifornia, he lived at 5719 Gaskill St in Oakland when he was 71 in 1922. I also found that the LDS have copied the church records from Dinkelsbühl. I have to go through these anyway for my father's maternal grandfather (for whom he is named) so I will make an effort to find out how the hasselbachers got to Dinkelsbuhl. I started looking at the LDS microfilms of the Church Books of Dinkelsbühl. There are several reels available and it will take a while. The first reel I looked at contained an alphabetical list of names from 1568 to 1815, indexed in the last century. It is not possible for me to determine for which sacrament the date is given, but presumably this will help work backwards. For the time being, the following points can be made. The first Hasselbacher, Ursula, appears in Jan 25, 1650. That's pretty early and corresponds with the arrival of other Hasselbachers in Franconia. Hasselbachers continue to appear every few years until the 1700s when there are several dozen. It appears that there are many fewer beginning in the 1800s. There was at least one who died in 1902. The names were transcribed with the usual mix of one or two s's and sharfs. There were a few variations such as Hasel, or Haas, or Hasenbacher that may or not be related.